It is often the case where I have to step and back and consider what is suitable to post on the blog, what crosses the boundaries of what is either too personal to share, oversteps my mark, or otherwise shouldn’t be disclosed. This was one of those posts, where that dilemma rears its head. After contemplation, retrospection and after conversing with others, I decided it would be a worthy inclusion. This entry focuses on real Grimoires, on one in particular, and the journeys that objects empowered properly can initiate bringing gnosis to the individual. Whilst this post isn’t intended to be a review, with me focusing on one particularly powerful book as an example, it could be considered one. Mark Alan Smith is the author who originally introduced me to the idea of the Primal Current as a cohesive path. It was upon first acquiring my copy of the Queen of Hell, an occurrence I’m quite sure was guided by Lucifer in hindsight, that I became aware that others had a connection with the same Spirits and Gods. The energies given off by that work, that book, resonated strongly with those I had been working with, and thus the identification and connection was immediately made. Queen of Hell was certainly my first introduction to a proper grimoire. This is a word I do not use lightly. The book ‘breathed’ the current, exuded force, something I could feel simply by handling it. This was in stark contrast to other books I had acquired in my time up to that point. 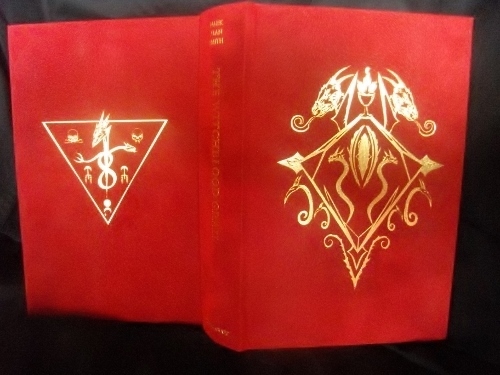 Many other Occult books that I possessed,although undoubtedly consecrated or otherwise ‘activated’ in some manner were certainly not ‘ensouled’ like this grimoire was. In comparison to Queen of Hell, they felt like nothing but lumps of dull, lifeless paper. The sheer obvious efficiency of whatever process used to ensoul these objects made me an avid and immediate collector of Marks book. Each grimoire when it arrived felt different, and denser in energy, mirroring the focus of each work. So when recently, the latest his line of work was released, as usual I felt compelled to pick it up. On arrival the book gave off an incredibly deep, and powerful energy that is difficult to describe. Whilst the previous entry, The Altar of Sacrifice felt cold and earth like, this book felt dissimilar in an unsettling manner. The taste of copper in the mouth and the tingling of the skin just some of the ways this was immediately perceived. For the next few days, this energy seemed to build. The atmosphere in the home became one like that before a thunderstorm. A heaviness and a charge seemed to build and build, and the ability to do anything was affected. Time itself seemed to slow, running like treacle, and an induced sense of drowsiness set in. What was to follow would be an intense experience as I was pulled through the gate held within the book itself, merely by its possession. It is obvious to me now that, given the following experience, that this feeling of build up was the catalyst for this experience. Below is the full account which was initially shared privately. ‘When I felt the need to sleep, I could feel the same energies being noticeably active. The vision, or whatever it was or best described, came sometime later in the sleep cycle as a fully lucid and describable out of body like experience, for lack of more appropriate terms. It was a pretty horrific state of affairs. I was dragged immediately into an orbit around what appeared to be the Earth, above England initially, and was made to see traumatic apocalyptic events in sickening clarity unfolding before me. First starting with the rise of the seas, the oceans pushing in with their horrific floods. This accelerated rising of the coastline quickly began swamping cities that lay along the coast, as well as inland as the rivers swelled like writhing bloated corpses. The ground then shook, giving way to seismic events which rippled across the entire surface of our planet which, in turn, triggered gigantic tsunami. These raced around the oceans, and I saw in vivid detail as these giant waveforms collided with multiple continents, racing inland and swallowing everything in their path. This continued for some time, as I was prevented from looking away, locked in place. I then saw an approaching asteroid or comet, which as it neared the atmosphere split into 3 distinct pieces as it tumbled down to the surface. 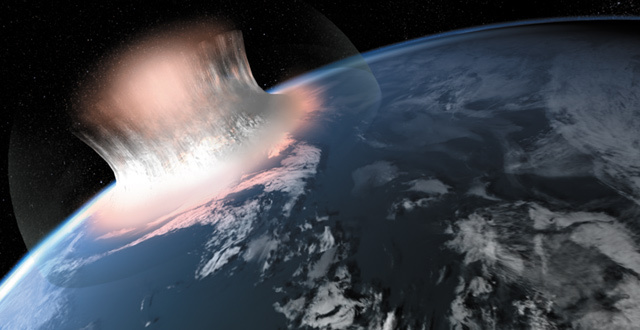 All three chunks hit, huge blasts echoing high into the stratosphere, unleashing giant shockwaves that triggered volcanic eruptions of hot swelling lava bleeding from the wounds in the earth. One slammed into the ocean, causing further gigantic waves, waves so utterly vast that they wiped out hundreds of millions, amid a firestorm raining down comprised of various debris and slicing volcanic glass. In between these myriad shown events, i could hear a roaring, impossibly loud, voicelike but sounding like the very roar of the Earth itself. This voice was noticeably some kind of male entity, and I could feel now as my attention shifted to it that it was It that was relating not by words but some other manner this apocalyptic vision. What felt like timescales of occurrences time was sped up to vast speeds and i was made to watch, unable to do anything, for what felt like hours and hours. Occasionally I was shifted into the perspectives of those below, witnessing their deaths in myriad ways. Finally, I found myself on the ground. In desperation, I made for what in this experience was high ground, seemingly able to finally move and shift through this realm I had found myself in. Although I assumed it was the devastated earth at the time, there were no points of reference to confirm this. The ground surrounding me I noticed had been charred black, and around me was a veritable maelstrom of utter fire and choking ash, as if I was walking through a pyroclastic flow. I was covered in some sort of black, paneled armour, unidentifiable in makeup that barely fought off the searching fingers of the boiling ash. As I fought against the intense wind whipped up all around me, I finally succumbed to the sheer force, and was blown sideways, or so I could determine, up into a cliffside. It was then I realized i was in the grip of some sort of entity. The roaring of the wind i realised was the same roaring of that entity, and it now reached a crescendo. The entity now addressed me directly, in words that felt like the cracking and rumbling of a thousand earthquakes. It was a voice of pure antimony. I cannot remember the exact words from my mind what it spoke, it felt like it was seriously sizing me up, probing deep within me for some manner. I tried to initially resist, but gave up eventually. The pressure on the external form grew and grew until it was overwhelming, and i felt almost surely i would be crushed to death if i wasn’t incinerated by the intense heat this thing was giving off. I could not identify it – it did not sound like Lucifer or Belial from my few meetings with them in similar realms whilst journeying in sleep. I could not see it, unable to turn towards it as its immense pressure held me firm. Recounting this, I don’t fully understand the purpose for being shown that this vision yet, but I think it was contact initiated by them through the soul fabric of the book. The intent being, to make me face the reality of the text itself. When reading the book it is easy to read it in a detached logical manner. Even if the conclusions are accepted and understood by the mind, they do not have that immediate, visceral impact of vision. However when confronted with the power of the book itself to actually bring its reader face to face with the actual reality of the apocalypse as described, it is a whole other ballgame. The ability for it to of its own accord cause journeying through the gates held within its material body was startling; taking you straight into its heart in a highly potent, incredibly distressing and challenging experience.Whether this was presented to me simply as a learning experience shown to me as part of my path, actual glimpse of what will happen, or both is something myself, and the reader, have to decide. The energies have subsided now somewhat, but can still be felt and experienced when handling the book. I feel like there are avenues of exploration between its pages far more than can be read and comprehend by the eye and mind alone. For anyone who has not experienced this, I recommend you search out such works, whoever they are by, and support the people that create them. They differ so wildy from the mass production, the works created solely for profit that are as soulless as the false industry that churns them out. Hopefully purely by example I have demonstrated how they are active tools that can be used in practice, and by the very act of their possession, reveal gnosis.